The Bottom End. The information within this editorial was inaccurate. ALWAYS TAKE THE TIME TO READ THE FULL STORY!!! I had actually contacted Tim Perlich after reading his short piece to inform him of his 'dodgy' journalism, and we exchanged a few emails (which I still have), where he realised that his article was severely inaccurate, and he himself acknowledged this. I then decided to write this piece after he ignored my request to retract what he had written. Due to the vocalists name (Valli Scavelli) being held back, the Acid Jazz bootleg, and the Working Week version of The Bottom End, where the original artists were not credited (even though Valli Scavellis name was known), M&K Sound was a name that did not come up when talking about the subject. It was said that, There was nothing else written on the record apart from the words, The Bottom End. Ken Kreisel stated that he had been contacted about the tune several times over the years, so obviously there were those who knew that M&K Sound had produced it. The few people that also saw it back in the day said exactly the same thing. This is quite normal, if you looked at a record briefly in a nightclub 20 years ago and never saw it again. The appearance of the record was a mystery itself amongst many people within the jazz-dance/club scene, as there were various descriptions of it. DJs were very secretive back then with their music. Some would cover the labels on the records, but according to Chris Bangs (the man who first discovered The Bottom End in the UK) this record was so obscure, you didnt even need to bother-perfect! On the club scenes, if a DJ had a major track, some of them would be quite reluctant to show people the record sleeve, as they would just say the name of the track or the artist. This still occurs today. DJs were (and still are) very protective over their music. Some DJ booths were no go areas back then. Even at the Electric Ballroom, the dancers stayed on the floor, and hardly ventured towards the decks. There was only one copy of The Bottom End within our scene for over 20 years, and when the original jazz-dance/club movement finished at The Electric Ballroom in 1986, Gilles Peterson did not play it out as often as before. Also, Gilles would spin the Acid Jazz bootleg rather than the original 12-inch. If it was just a case of checking the details on the vinyl, and contacting the company, there would have been no mystery at all over the record for so many years. When Vallis name was given in 1982, this was only 6 years after the track was cut, so it would not have been too much trouble for Ken Kreisel to trace the artists. When I was in contact with Kreisel two and a half years ago, he could not recall much about the famous recording, but he did remember a similar request years before. When I sent him the track on an MP3, it did jog his memory, but there was still nothing conclusive. There had been many enquiries about the track over several years, but it was only through my story that Ken Kreisel got a clear understanding of its significance in the UK, and what all the fuss was about. He said that there were always telephone calls or letters over the years, regarding one of the old M&K Sound test discs being played in a London disco, but was never clear what people were talking about. When I looked at the record again (after 19 years), and took down the info on the sleeve, neither the telephone number nor address existed anymore. Obviously, I did a search on the Internet, and acquired M&K Sounds new address and telephone number, and contacted them the same day. I sent lengthy emails, and telephoned M&K Sound, but Ken Kreisel was not available at the time. At first other employees within the company dealt with my request, until eventually there were direct negotiations with Kreisel. This process itself did not take so long. The real work started after making contact with Ken Kreisel, but it was never a real problem getting hold of him in the first place. I was just very impressed at how sincere and helpful he was. Even the owners of the original 12-inch (Chris Bangs, Gilles Peterson, and others who were aware of M&K Sound) could not solve the mystery with the information that M&K Sound had produced the track. It took several weeks of digging with Ken Kreisel before we hit gold. We both have files on the subject now, due to all the information which was gathered during that period. The UK probably has the most serious and largest community of collectors for Jazz-Dance tracks like The Bottom End. This makes sense considering the fact that the scene came out of the UK originally, and is still active in small pockets across the country. The Japanese, as well as others, are major collectors of this music too. I am very familiar with the big collectors, as I have known them for a considerable amount of years. It was one of these collectors who told me 8 years ago that he had sold the original album, featuring Janet Lawson with a Japanese Trio. I have put many collectors on the trail of the Bottom End over the years, so I am very aware that it is known within the "collectors' circles" (see the quotes at the end of: The Bottom End In Search Of The Holy Grail and information within The Bottom End Full Story). There is another volume of The Bottom End. Volume Two, Bottom End Musical Bass & Transient Test Record is more common than its predecessor, and can found on Dcc blowout, Gemm.com, as well as other sites. A quantity of the Volume Two records that were pressed have the same sleeve design as the original (Volume one), and have often been mistaken for each other. Through this, it is easy to get the impression that the "Get off the Ground" (Bottom End) turns up more often than it actually does. 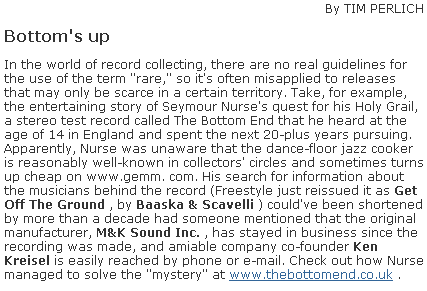 Some of my friends, and the big collectors in the UK that are familiar with the tune have been customers of Gemm.com for many years, so the copies of The Bottom End (Get off the Ground) that have turned up on their site must have "slipped through the net". Audiophile specialists Dcc blowout said that Volume One featuring the Get off the Ground was very rare, and copies in very good condition only came around every few years, if you're lucky. Ken Kreisel himself said that, not many were pressed. Also, these records were not for sale. The fact remains that the record is rare, so the definition of the word is certainly not misapplied in this case. Of course it would make more sense for them to turn up in the United States, but London is quite a distance from California. Ken Kreisel told me that he was "amazed the record found its way to London". This was an extremely rare piece of vinyl in the UK, during a time period where having the luxury of finding, and purchasing obscure gems on the Internet did not exist. The world is a much smaller place now for collectors, due to the Internet. A few of the original M&K 12 inches have now turned up on Ebay (mainly from California, which is not surprising), due to my story on the sleeve notes of Gilles Peterson Digs America album, featuring Baaska and Scavellis shorter version of Get off the Ground. Also, since the launch of The Bottom End site, those in possession of the record are now aware of its significance and value. Of course a few of these records were "floating" around on the Internet before, but due to the exposure of the story, more of them are now surfacing, which was to be expected. Again, the game of record buying and selling has changed. Anybody who is in the possession of rare vinyl (without knowing its true value) can now sell it on the Internet through Ebay, eliminating record shops, private dealers, and collectors' of the elite vinyl world. If only 100 of The Bottom End's were originally pressed and 20 of them suddenly turned up on the Internet in a short period of time, this would not dismiss the fact that only a small amount do exist. Each copy on Ebay has had extracts from the Ken Kreisel interview/ profile on this site attached to it, or references from Petersons sleeve notes. Even if many more copies had been discovered within our scene over the years, this still would not have given any indication in regards to who the mystery musicians were on the track. THE HOLY GRAIL WAS THE NAME OF THE ARTISTS, VALLI SCAVELLI AND DON BAASKA, NOT THE RECORD ITSELF (EVEN THOUGH IT IS SOMETIMES REFERRED TO AS THE HOLY GRAIL), AND THE QUEST WAS THE 23 YEAR SEARCH FOR THEM. I never owned a copy of THE BOTTOM END ALBUM when my story came out, which shows that the "mystery" had nothing to with the search, or possession of the record itself. For more information, please read: The Bottom End "Full Story"
NOTE: A few Bottom End Bass & Transient Test Record - Various Sounds Volume 2 (M&K Sound) have been turning up on Ebay. The cover design is exactly the same as Volume One, featuring Baaska and Scavelli's "Get off the Ground", but it is a completely different album. Volume One ("Get off the Ground") has just 'one' track on each side (Jazz on Side A). The Volume 2 (with various sound recordings), is also being advertised under the genre of "Jazz", so be aware just in case you may be getting the impression that you are purchasing the "Get off the Ground".